This piece marks the current tactic being used by a civilization's military forces. The octagonal counters are used to track accumulated culture points and science points. The round markers are used to indicate four ratings of each player's civilization: culture production, science production, military strength, and happiness. Put your happiness rating marker on space 0 of the happiness indicator on your player board. Take 16 blue tokens and put them on the squares of your blue bank. Take 25 yellow tokens and put them on the remaining squares on your player board: 18 in your yellow bank, 1 in your worker pool, and 6 on technologies. Take 4 white tokens and 2 red tokens and put them next to the right edge of your player board. Once everyone has set up their player boards, return the remaining tokens to the box, or keep them somewhere else out of reach. Usually, you will move tokens within your player area. Only rarely do you need to get new tokens from the box or return tokens to the box. The seven yellow tokens that are not in your yellow bank are called workers. They represent the initial population of your civilization. Six of them begin the game on various cards. These workers represent one military unit, two farms, two mines, and one lab.. The seventh worker is in your worker pool. It is called an unused worker. It does nothing useful now, but it is available to be put to work. The six cards printed on your player board are your initial technologies. We refer to them as cards, even though they are printed on the board. They represent what your civilization knows and what it can build. The Warriors technology allows you to build warriors, which are military units. The 1 worker on the card represents 1 warrior unit. The symbol at the bottom depicts each unit's strength. Your one warrior gives your civilization a strength rating of 1. The icon in the upper right corner means that units on the Warriors card are infantry. Later, you may invent more advanced infantry units, as well as cavalry and artillery . Blue tokens represent food and resources. On a farm technology, they are food. On a mine technology, they are resources. You keep the blue tokens in your blue bank until they are needed. When your workers produce food and resources, you move blue tokens from your blue bank to the cards. Always move the rightmost tokens first. When you use the food and resources, you return the tokens to your blue bank. Fill empty spaces from left to right. If a section of your blue bank is empty, it means your civilization is storing a lot of food and resources. This is not a problem if you spend them during your turn, but if you still have empty sections at the end of your turn, you will face corruption. The yellow tokens in your yellow bank do not represent workers. You may think of them as unused land in your territory. Whenever your population increases, you take the rightmost yellow token from the yellow bank and put it in your worker pool. 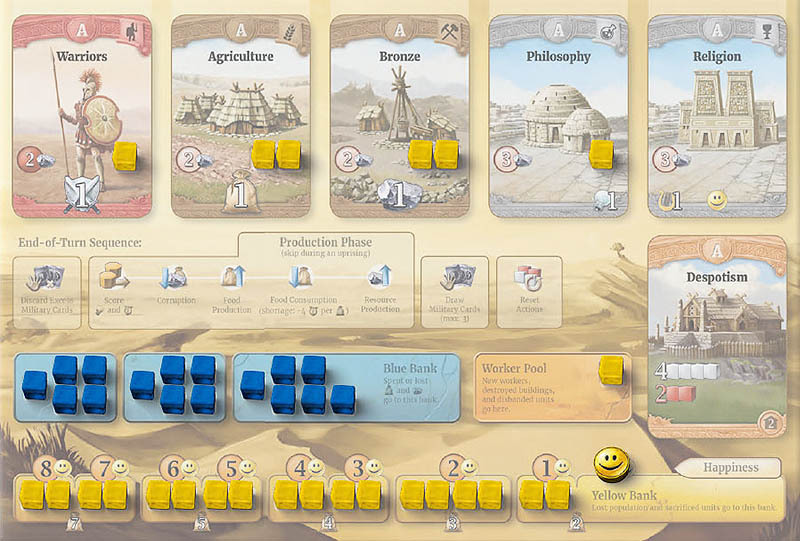 You gain a worker, but having fewer tokens in your yellow bank means less available land in your territory. As your population density increases, so do your people's demands. This is represented by the sections and subsections of your yellow bank. At the beginning of the game, your people do not consume stored food. They can hunt or grow it for themselves. You use up stored food only when you want your population to grow. The cost of increasing your population is depicted under each section. As your population grows, the yellow bank empties. You will need some food to maintain your population, and increasing the population will cost you more food. Agriculture is a farm technology, which allows you to build farms . Bronze is a mine technology, which allows you to build mines . The card itself does not represent an actual farm or mine. It is just the knowledge required to build them. Farms and mines are represented by your workers on the cards. You start the game with two farms and two mines. The symbols at the bottom of these technology cards say how much food or resources each farm or mine produces. Food is important for increasing and maintaining your population. Resources are used to build farms, mines, urban buildings, wonders, and military units. Philosophy allows you to build labs and Religion allows you to build temples . As with farms and mines, actual buildings are represented by workers on the cards. The card itself just means you know how to build them. At the beginning of the game, you have 1 lab, but you have no temples yet - there is no worker on the Religion card. The icons at the bottom of each urban building technology depict what is produced by each building on the card. Your one lab produces a total of 1 science . Your temples would produce 1 culture and 1 happy face each, but you have no temples yet. The icon in the upper right corner ( , ) defines the type of the card and the type of the buildings that are on it. Later, you may invent more advanced labs and temples or even completely new types of buildings. In your first game, you will not use Age III cards. The game will end when you reach the Modern Era. Sometimes, the rules or a card will refer to the level of a card. This is simply the card's age represented as a number: Cards of Age A have level 0. Age I is level 1. Age II is level 2. Age III is level 3. The level or age of a farm, mine, urban building, or military unit is the same as the level or age of the card that it is on. The orange card represents your civilization's system of government. It specifies the number of civil actions and military actions available each turn. These actions represent the effectiveness of your government. They determine how many different things you can do. Every civilization begins with Despotism. The 4 white cubes and 2 red cubes printed on the card indicate that you have 4 civil actions and 2 military actions at your disposal. These are represented by the white and red tokens you have next to your board. Later, you may switch to a more advanced form of government, which will give you more civil and military actions. Various urban buildings, wonders, and leaders provide happy faces - a symbolic representation of things that keep your people happy, such as art, religion, or entertainment. Your total number of happy faces is indicated by your happiness marker above your yellow bank. At the beginning of the game, the only technology that provides happy faces is Religion. Because you have no workers on that card, you have no temples , so your happiness rating marker begins on space 0.